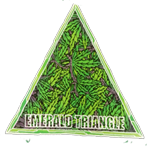 Emerald Triangle - Mastodon Kush REG. Free US delivery. This F1 cross of two heavy indicas produce large dense buds, which are all covered in resin all the way down the stem, making it a great hash maker's strain. The large fan leaves give her a shallow canopy, so it's best suited to topping and works well in a sea of green of SCROG method. Be sure not to bring your bottoms up too much, as the buds down the stem are more substantial than you're used to seeing. The flavours are peppery and sweet, with the distinctive Kush flavour underneath. When flushed properly, the finish is very smooth, making Mastadon Kush easy on your throat and lungs. You'll notice an initial high, followed by a slow easy descent into your couch. It is ideal for pain management and insomnia.